These beautiful stained glass windows above the altar were made by Mayer & Co. of Munich, now known as Franz Meyer of Munich, Inc. The firm is famous for stained glass design and manufacturing. 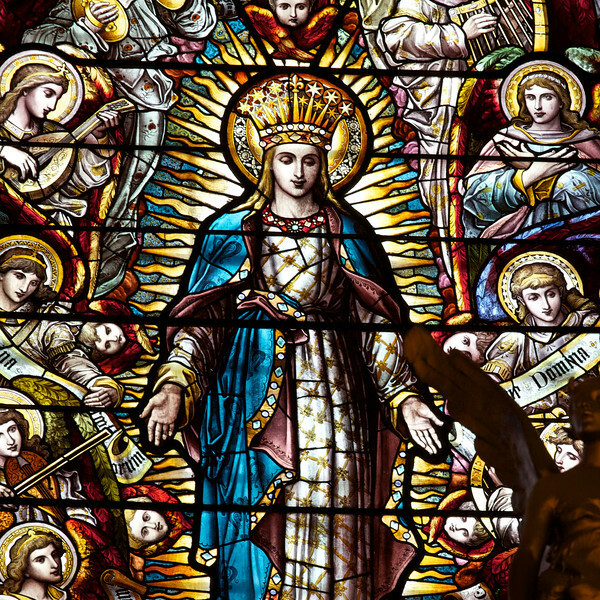 Founded in 1847, the firm was popular in the late 19th and early 20th centuries for providing stained glass to large Roman Catholic churches constructed during that period. Wikipedia provides a long list of churches that feature Mayer stained glass windows throughout the world. The company still exists and the New York Mass Transit Authority is one client. Franz Meyer mosaics can be found at the South Ferry, 86th Street, 42nd Street and 8th Ave., Penn Station, and Bryant Park subway stations just to name a few. For more detail on their work, see the Franz Meyer company website.